Veterans Memorial High School (VMHS) senior Kivani Sanchez has received a Hispanic Heritage Youth Award from the Hispanic Heritage Foundation. She was named an ExxonMobil Scholar for her engineering and math achievements at a recent awards ceremony held in Houston, TX. The Hispanic Heritage Youth Awards program offers educational grants to Hispanic high school seniors chosen by regional selection committees, based on their academic achievement, leadership, community service, their category focus, and an essay about the important role their heritage has played in their success. Pictured is Sanchez, right, as she is congratulated by Mario Chavez, department manager, ExxonMobil during the recent awards presentations. Sanchez is one of 15 regional recipients. 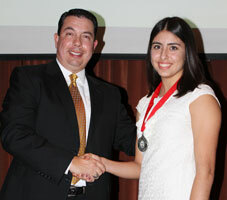 As the silver medalist in the Engineering and Math category, Sanchez was awarded a $2,000 scholarship to support her plans to pursue a degree in chemical engineering.